“Conventional” and “organic” farming systems have been compared in many studies. 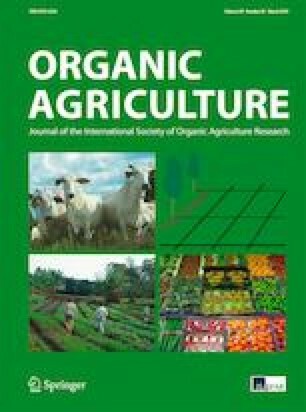 However, the lack of concern about the diversity of both conventional and organic farming systems can be imputed to the oft-quoted methodological difficulties of comparing conventional and organic systems. Indeed, the analysis of articles on genotype performance of small-grain cereals under conventional and organic management strategies revealed that there are significant variations in input levels within conventional systems and within organic farming. In addition, this could lead to conflicting results when attempting to identify the best breeding strategies for organic management systems. To boost breeding activities for the organic sector, our proposal is the establishment of an international classification of agroecosystem managements based on recognized agro-climatic and management indicators. Management classifications are proposed for both conventional and organic management strategies. This work would facilitate the sharing of new results among agronomists and breeders for designing adapted and efficient organic breeding strategies. “Conventional farming” is generally associated with high-input modern agriculture which includes the use of synthetic chemical fertilizers, fungicides, insecticides, and herbicides. However, this term, which is commonly used in the scientific and agricultural literature, is devoid of technical content. To draw a general definition, conventional farming qualifies the predominant agricultural practices applied in one region (Viaux 1999). Conventional farming is contrasted to organic farming as the latter prohibits the use of synthetic fertilizers and pesticides. Approved certification bodies certify producers based on a set of production standards. Organic agriculture relies on healthy living systems, taking advantage of biodiversity and recycling (Council of the European Union 2007). Differing in terms of input levels, several non-organic management strategies for crop cultivation can be distinguished. Intensive high input (HI) or high-yield agriculture is characterized by heavy use of pesticides and chemical fertilizers. Integrated pest management (IPM) aims to reduce the use of pesticides to levels that are economically and ecologically justified. It emphasizes the growth of a healthy crop with the least possible disruption to agro-ecosystems and encourages natural pest control mechanisms (European Parliament 2009), with the use of pesticides as a last resort. The concepts of “low-input” (LI) farming systems and extensive (EXT) farming systems are sometimes used interchangeably (Nemecek et al. 2011). However, in this paper, focusing on small-grain cereals, we distinguish the experimental low-input management (Liexp) from extensive farming. 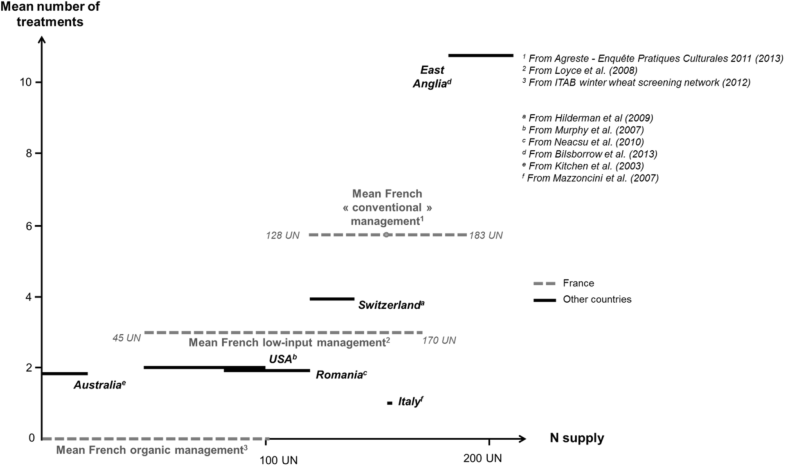 The low-input management is a breeding strategy management equivalent to the Swiss “Extenso” management (Schwärzel et al. 2006), in which weeds are controlled by herbicides and mechanical weeding, and the use of fungicides and growth regulators is prohibited. Nitrogen fertilization also is reduced (Le Campion et al. 2014; Loyce et al. 2008, 2012). Extensive farming is here considered as a very low-input management system that uses very small amounts of fertilizers and pesticides relative to the low-yield potential of the land area. Besides, this latter management can be followed to respond to specific environmental constraints (water quality recovery plans in catchment basin). With the expansion of organic farming across the world, numerous reports have compared the performance of organic and conventional agriculture in terms of yield, environmental, and economic impacts. These studies have repeatedly been compiled in meta-analyses (Badgley et al. 2007; De Ponti et al. 2012; Ponisio et al. 2015; Seufert et al. 2012; Stanhill 1990). Plant breeding became one field concerned with conventional versus organic comparisons in the objective to increase crop yield and quality under organic conditions and many studies dealt with this issue. After a lack of breeding efforts dedicated to organic farming from the half to the end of the last century, such concern grows gradually in the breeders community, because the breeding of adapted varieties aims at playing a key role in designing sustainable farming systems. As underlined by Lammerts van Bueren et al. (2011), it is estimated that more than 95% of organic production is still based on crop varieties that were bred for the conventional sector and consequently lack important traits required under organic and low-input production conditions. Indeed, quantifying genotype × environment × management interactions is a good method for establishing efficient breeding strategies. Small-grain cereals is one of the most relevant crop type in global food security, and as such, the move toward resilient and more sustainable small-grain cereal production, in particular, winter bread wheat, by reducing levels of chemical inputs is a major challenge. We carried out a comparative analysis of the scientific literature on the comparison of genotype performances of small-grain cereals under organic and conventional managements in a plant breeding context. This analysis aimed at identifying gaps and bottlenecks in the development of a comprehensive breeding strategy for organic farming. Our goal was to identify studies comparing small-grain cereal performance under conventional and organic management systems in a breeding context. A full literature search on our issue was carried out using the ISI Web of Science without specifying a date limit or specifying that the report had been cited to ensure coverage of older and unreferenced publications. When sufficiently detailed (detailed number of treatment, detailed fertilization) crop management sequences were provided then the conventional and organic managements were inventoried. Only a small number of studies provided a detailed description of the organic management used and in that case only the fertilization regime (amount and type) was specified. Only papers which clearly referred to the expression conventional were included. We used our findings to establish a list of detailed conventional crop management sequences for several small-grain cereal cultivations worldwide (Table 1). All the agricultural practices presented are part of an experimental design, which aims to be representative of local farming practices. The crop management sequences extracted from the selected papers comparing genotype performances under conventional and organic management in several small-grain cereals farming are compiled in Table 1. Due to the wide range of input levels used in farming practices across the world, it was not possible to define one standard conventional management. Fungicide use, sprayed onto crops to protect them from fungal diseases, differed particularly among studies. This variation is partly related to climate. Indeed, fungicide use is mostly restricted to North-Western European countries where cereal farming is the most intensive in terms of chemical inputs (Bilsborrow et al. 2013; Przystalki et al. 2008). Nitrogen (N) inputs also differ greatly from one region to another: from 15 to 25 kg ha−1 of N in Australia (Kitchen et al. 2003) to more than 200 kg ha−1 of N in East Anglia (Bilsborrow et al. 2013). The use of herbicides is the most widespread agricultural practice; only one Turkish study does not mention herbicide use (Gevrek and Atasoy 2012). The diversity in winter wheat conventional managements can be linked to the contrasting wheat yields obtained across the world (Monfreda et al. 2008). Indeed, input levels parallel wheat grain yield potential. When yield potential is high, then higher yield production is sought and secured by high input management. In North-West Europe and parts of Central Europe, from the UK to the Balkans, conventional management involves high levels of nitrogen fertilizers (from 100 to 200 kg of N per hectare) implying the use of plant growth regulators to prevent lodging which increases with N input. Fungicide use is less predictable because of the uncertainty of disease pressure which depends mostly on climatic conditions during spring. In the North-East and the North-West of the USA (Murphy et al. 2007), the use of mineral fertilizers is quite low and only herbicides are applied on winter wheat crops. However, in relation with relatively dry growing conditions, the smallest quantity of mineral nitrogen is observed in Australia (Kitchen et al. 2003) and in Canada when considering conventional management of Canadian spring wheat (Kirk et al. 2012; Reid et al. 2009, 2011). Because of the small amount of N applied, the conventional management described in these studies would be qualified as an extensive management. This variability in input levels within conventional management at a global scale can also be examined by considering the pesticide use in winter wheat assessed as the treatment frequency index (TFI) in North-West Europe: this index, which express the number of time an agricultural area in rotation can be treated with a full dose, varies from 6.75 in the UK to 4 in France, reaches 5.8 in Germany and drops to 2.3 in Denmark (Jørgensen et al. 2014). The diversity of conventional wheat farming systems around the world can also be appreciated at the country scale, in France for example. 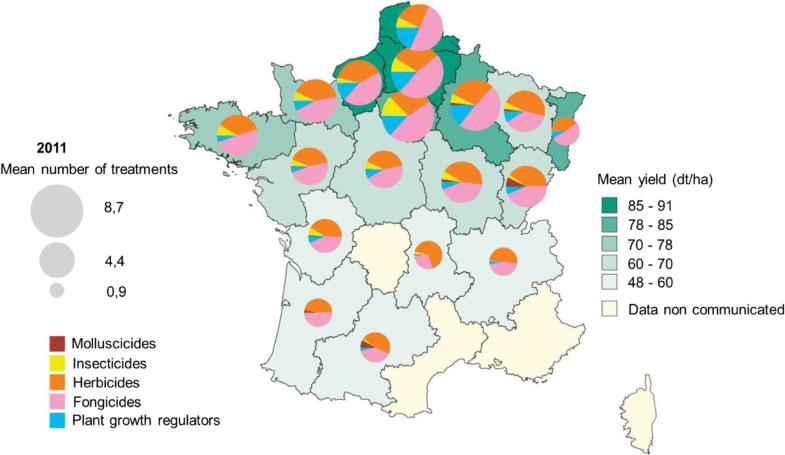 The variability of French conventional farming systems was highlighted by a survey of French farmers, which provided an estimate of input use in France (Agreste 2013). The number of pesticide applications varies twofold from one region to another (Fig. 1). High yielding regions still correlate with high pesticide and mineral fertilizer applications in a yield maximization strategy. Also, France is split between North and South, where yields are lower as well as pesticide usage. So, at the country scale, the widespread conventional management differs greatly from one region to another, because of this intrinsic yield potential but also because of variation in disease pressures or in the type of farming production system (crop-livestock farming systems versus crop-based farming systems). Petit and Aubry (2015) have recently pointed out that methodological difficulties of comparing conventional and organic systems can also be ascribed to the lack of knowledge on the diversity of organic systems. Certified organic farming stipulates that no chemical inputs will be applied to the crop. This reduced use of agrochemicals amplifies unpredictability in crop performance due to a stronger genotype × environment interaction (Desclaux et al. 2008). Such strong environmental pressure under organic conditions is highlighted in breeding programs by yield heritability estimates in organic multi-environment trials. Indeed, the mean yield heritability estimated under organic conditions is generally reduced compared to that estimated under high- and low-input conditions (Ceccarelli 1994; Kokare et al. 2014; Le Campion et al. 2014; Messmer et al. 2012; Muellner et al. 2014; Reid et al. 2009). However, it is difficult to precisely characterize the components involved in such heterogeneity due to multiple limiting factors. Thus, local production context and agricultural practices play a substantial role in yield variability in organic farming. In organic winter cereal cultivation, nitrogen availability during stem elongation is the major factor constraining yield performance. For almost half of the experiments listed in Table 1, no organic fertilization was applied, emphasizing differences in organic fertilization practices. In fact, both the local agricultural context and agricultural practices are strongly interdependent. For example, N availability depends strongly on the farming system. In mixed farming-livestock system (livestock on the farm or in the neighborhood), manure or slurry provide N, while cash-crop systems depend on legume crops to supply N to the soil. This gap is even wider considering that crop-livestock farming systems benefit from an outlet for legumes as animal feed, which will thus take an important place in the cropping pattern in contrast to cash crop systems. The fertilization type, necessarily organic under organic farming, is the key factor distinguishing different “environments” in organic farming and the main factor involved is the quantity of soluble nitrogen directly accessible by plants. However, this information is rarely included in the literature which limits comparisons between organic systems, which can benefit from a large range of fertilization practices from green manure crop to manure or slurry amendment and other organic fertilizers (feather meal, beet pulp, etc.). A large difference in terms of soluble N and mineralization kinetics exists depending on the type of organic fertilization. Indeed, the amount of N available from poultry manure or litter (Eghball et al. 2002) is more than twice as high as the N available from a dairy or compost manure, which mineralizes slowly depending on microbiological activity related to soil temperature. Gopinath et al. (2008) also highlighted this key role of the form of organic fertilizer: compared with conventional management (mineral fertilization), yield reduction under organic conditions varied from 36% to 65% for a first experimental year and from 23% to 54% for the second year depending on the organic fertilization treatments. Several authors have suggested that due to such variability in farming contexts and fertilization practices, two sub-environments can be differentiated within organic farming. Indeed, they insist on the need to distinguish more intensive, i.e., nitrogen-rich systems, from more extensive organic systems (Baresel et al. 2008; Hildermann et al. 2009b; Mäder et al. 2007). This consideration could justify the development of dedicated breeding strategies for each organic environment target. The effects of conservation tillage practices on yield are also a main concern. Thus, several studies compared the effects of conventional tillage, no tillage, and reduced tillage on winter wheat yield and quality. Reduced tillage or no tillage appear to reduce yield without affecting grain quality under organic conditions (Berner et al. 2008; Bilalis et al. 2011; Peigné et al. 2014; Cooper et al. 2016). The factors implicated in this yield reduction are unknown (Mäder and Berner 2012). However, although the division between tillage and no or reduced tillage is clear, this type of comparison would not be relevant in a breeding objective. Indeed, it seems difficult to set up an organic breeding program under no tillage or reduced tillage conditions as suggested by Bilalis et al. (2011). Managing weed infestation in such conditions would be difficult and would provide unpredictable genotype value. It would also represent an extra investment, which has to be considered for organic breeding programs which are already expensive. Thus, organic farming appears as a heterogeneous system providing contrasting performances due to a strong environmental influence and a large diversity of farming practices and local production contexts. Furthermore, even if a common feature of all organic conditions is that chemical inputs are prohibited, N availability may be high or very low depending on fertilization practices and rotation. The aim of Fig. 2 is to summarize a continuum in farming practices from high input to organic crop managements, based on two major criteria: N supply and the number of treatments (pesticides) applied to winter bread wheat. One treatment is equivalent to one application of one commercial product. which, respectively, display the mean conventional, low-input (LIexp) and organic management systems in France. These French management strategies are compared to conventional management strategies detailed in five papers from different parts of the world (Table 1). Within each management system, some differences in terms of input levels can be assessed. This figure does not take into account the residual amount of N available because only a few papers supplied this information. However, the gap between Australian and English managements, both qualified as conventional by the authors, can be underlined. Thus, as mentioned above, the term “conventional” while referring to the most widespread farming practices in one region, is misleading at a world or country scale. As demonstrated by organic-to-conventional yield ratios (Table 1), the yield gap between the two managements is highly variable among studies (from 44% to 96%). The yield reduction is very contextual and depends on the intensity of the conventional crop management plan and local yield potential. Also, the year effect plays an important role in cereal performances. In plant breeding, to characterize the most suitable selection environment for one target environment, it is necessary to deal with genotype × environment × management interactions. Also, numerous authors worked on this issue to assess if it would be useful to set up dedicated breeding schemes for organic management systems. The question of the importance of genotype × management interaction and of the correlation between genotype performance under conventional and organic conditions was studied in several trials worldwide. However, there is no general agreement among studies to identify the best selection environment for organic farming systems. Several papers suggested that indirect selection for yield (in conventionally managed conditions) of bread wheat destined for organically managed production is efficient. Annicchiaricho et al. (2010) compared the response of winter wheat varieties under organic and conventional systems across Italian locations. Their study emphasized that selection for specific geoclimatic subregions has greater importance than selection for specific production systems, with winter bread wheat yield potential being very variable from one part of Italy to another. An Australian study, using many experimental comparisons of organic and conventional farming systems, concluded that none of the winter bread wheat varieties tested showed an adaptive advantage for one farming system over the other (Kitchen et al. 2003). In Switzerland, genotype × system interactions were generally not observed and organically or conventionally bred winter wheat cultivars obtained comparable performances under organic conditions (Hildermann et al. 2009b). Contrary to these reports, numerous studies on spring wheat in Canada (Kamran et al. 2014; Kirk et al. 2012; Reid et al. 2009, 2011) and winter wheat in USA (Baenziger et al. 2011; Murphy et al. 2007), Turkey (Gevrek and Atasoy 2012), and Germany (Baresel and Reents 2006) have clearly highlighted the superiority of direct selection to screen genotypes for organic farming conditions supporting that breeding for organic production should be conducted on organically managed lands. This point was partially supported by several authors who argued that both information provided by conventional and organic trials should be relevant to set an efficient organic breeding strategy. Also, in a Latvian paper focusing on spring barley (Kokare et al. 2014), the authors supported that selection of genotypes for organic farming may take place under conventional conditions but a final testing should be conducted under organic conditions to confirm the suitability of the selected variety. Similar findings were reported for triticale in Latvia (Kronberga 2008). Besides, notwithstanding high genetic correlations, Przystalski et al. (2008) observed poor agreement in rankings when comparing cereal varieties in organic and non-organic systems in Europe. By deviating from the “common” conventional versus organic dichotomy, the inefficiency of indirect selection when comparing high-input and experimental low-input conditions (LIexp) was demonstrated for winter wheat in North-West France (Brancourt-Hulmel et al. 2005; Loyce et al. 2008, 2012). Also, breeding programs targeting low-input environments should include low-input selection environment to maximize selection gains. Focusing on genotype performance within low-input agriculture, it was shown that data from low-input management trials provides quite reliable predictions for genotype yield and grain protein content (Le Campion et al. 2014; Muellner et al. 2014; Schwärzel et al. 2006). However, it does not provide helpful information on genotype baking quality for organic farming with low nitrogen availability. A similar observation was made in Canada where spring wheat cultivars exhibited somewhat different baking characteristics when grown in the two management systems (Mason et al. 2007). On the contrary, the interaction between systems and cultivars was found not to be significant in Romania, in the case of quality parameters (Neacsu et al. 2010). These contradictory reports can partly be explained by the lack of comparability within conventional and organic systems. As demonstrated above, the intensity of conventional farming varies considerably among countries and sometimes, as in France, between regions of one country. The same comment can be made for the experimental conditions of organic farming which can strongly differ, particularly in terms of nitrogen availability. As an example, in the dry conditions of South Australia (Kitchen et al. 2003), wheat yields are often limited by rainfall. Thus, the conventional management is extensive and close to the organic management. The yield gap between two managements is highly determined by rainfall: when conventional systems produce low yields due to marginal rainfall, organic systems tend to yield higher relative to conventional systems. Thus, this climatic-limiting factor can explain why none of the varieties tested showed an adaptive advantage for one farming system over the other. On the other hand, in the rainy conditions of North-West France, mean yield under low input conditions (low N, no fungicide) was about 70% the average yield of high-input conventional winter wheat production which reached 9.5 t ha−1 (Loyce et al. 2008, 2012). As a consequence, in such conditions, indirect selection was never more efficient than direct selection. However, in north Switzerland, no genetic variation was found between modern conventionally and organically bread winter wheat varieties under organic conditions on fertile soil (Hildermann et al. 2009b; Messmer et al. 2012). Nevertheless modern organically bred cultivars were superior under low yielding organic conditions (Hildermann et al. 2009a). As a result, each management comparison trial is specific and determined by interactions between varieties, management, and environment, in which the latter depends on agro-climatic limiting factors. Thus, to permit management comparisons in a breeding context, it is necessary to precisely define managements and environments and to add standardized labels. An international classification would facilitate to the breeders the sharing of new results and the exchange of lines in a multi-environmental screening purpose. For both managements, a climatic or agro-environmental indicator (temperature, rainfall) would be informative to identify main limiting factors. Yield potential assessed by the mean yield obtained under mainstream management conditions is a synthetic result of climatic and agro-environmental conditions. This mean yield indicates the fertility status of the land. We divided yield potential for cereal cultivation in three classes: P++ for high yielding lands, P+ for intermediate yield potential, and P− for stressful environmental conditions. “TFI” and “nitrogen supply” are also useful to characterize the conventional managements. Thus, based on these three criteria, a first frame of management classification is proposed in Table 2. This classification is mainly based on crop managements (CM) described by Loyce et al. (2008, 2012). In Table 2, the N balance-sheet is calculated proportionally to yield potential (Rémy and Viaux 1982) which depends on local growing conditions. Thus, nitrogen input is assumed to decrease from N balance-sheetP++ to N balance-sheetP. Even if organic systems can be easily identified as managements in which the use of chemical inputs is prohibited, organic farming encompasses a wide diversity of environments. In Table 3, we propose three classes to distinguish organic conditions for cereal cultivation based on mean yield potential under mainstream management strategy described in Table 2. In its present form, the classification of conventional management strategy and organic farming for small grain cereals is not completely reliable. Upper and lower limits of each class can seem quite artificial because they were determined empirically. This is a first trial to classify management conditions and it need to be improve. Indeed, statistical analysis would be more convincing to determine clear borders between different classes. But as demonstrated by Table 1, it is hard to compiled data on conventional managements for small grain cereal production. Conventional versus organic comparisons are topical and abundant in the scientific literature and cover several scientific areas. These comparisons are of interest beyond the scientific community in particular when they deal with issues such as environmental impact (Gomiero et al. 2008; Tuomisto et al. 2012), biodiversity (Bengtsson et al. 2005; Hole et al. 2005; Winqvist et al. 2012), or health (Barański et al. 2014). However the regular use of the term “conventional” has made us forget its lack of technical content. As demonstrated here, using the example of small grain cereals organic breeding, numerous studies employed the term “conventional” but with their own significance in terms of input levels, making any attempts to generalize the results somewhat tricky. This is also prejudicial in the definition of an appropriate breeding strategy for organic farming conditions. Thus, to exploit the diversity of wheat germplasm as agroecosystem services a clearer characterization of agroecosystem managements is needed. To boost breeding activities to the organic sector, our proposal is the establishment of an international classification of agroecosystem managements based on recognized agro-climatic and management indicators. This work would facilitate to the breeders the sharing of new results in the designing of adapted and efficient organic breeding strategies. The authors wish to acknowledge the sustainable novel crop material team (UMR IGEPP - Rennes-Le Rheu), which contributed to this study. The authors gratefully acknowledge L. Saur, A. Gravot, A-M. Chèvre. S. Guyot, L. Guichard, M. Barzman, R. Euvrard, J.P Deguine, I. Felix, and C. Kerbrat for their direct or indirect involvement in the preparation of this paper. Thank you to Leigh Gebbie for English proof reading. Our studies have also been supported for the last 15 years by the French Technical Institute for Organic farming (ITAB, network coordinated by Laurence Fontaine) and InterBioBretagne as part of the State-Region (Bretagne) Project Contract (CPER network, coordinated by Gerald Cartaud and Stanislas Lubac). The authors would like to thank MM. Chevalier, Ingrande, Mogis, and Pinelli, organic farmers who received INRA on-farm trials in Brittany, Poitou, and Ile-de-France regions for 12 years, and for sharing their knowledge and perspectives on agricultural practices.